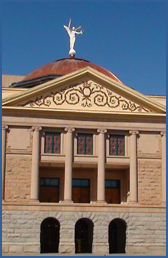 The offices of the Arizona Council of Human Service Providers are located at 2100 N. Central, Suite 225, on the NW corner of Central and Holly. If you are coming from the north, you can turn right onto Holly when heading south on Central. Then turn into the parking garage on right hand side of the street—it is the first driveway you will come to. From the south, take McDowell Avenue to 1st Avenue which is the first street west of Central. Go north on 1st Avenue to the first stop sign, which is Holly. You will have to turn right here. The building will be on the left on the corner. The parking garage will be the last drive on the left before Central. If you are coming north on Central Avenue, you can turn left on Palm, go to the first stop sign at 1st Avenue, turn right and follow the directions from above from there. Visitor parking spaces are marked—but you may need to either park at the meters on Holly or in the Central Park Square Garage on the south side of Holly—we will validate your parking ticket from the parking garage. Bring your parking ticket with you! To get into our building, you have to enter through the parking garage. Take the central staircase or elevator to the second floor. Turn left at the top of the stairs and go into the last door on the right for meetings in the Board room. To get to the office, go left at the end of that walkway, and turn right through the glass door. Walk down the hallway to the last office on the right. Please call us at 602-252-9363 if you need additional information on how to get here.